The art and architecture of the ancient Egyptians is amazing enough. That they could also map the sky, nearly as well as it is done in the 21st century, is simply astounding! 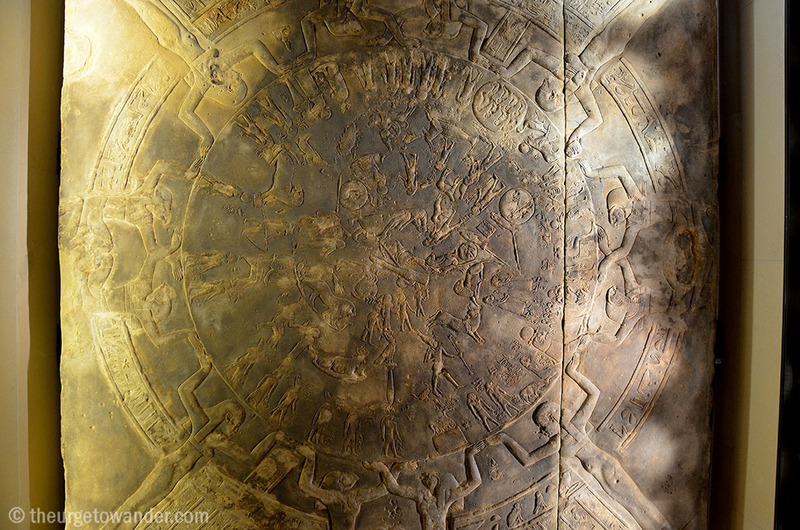 A bas relief – the Zodiac of Dendera – that was found in the Temple of Hathor proves this beyond a doubt. This 8 feet square, sandstone ceiling panel from 50 BC, is reputed to be the worlds first horoscope that charts the movements of the stars and depicts the zodiac constellations, quite like we do today! And it comes replete with theories of encoded messages and ‘end of world’ prophecies. If you want to see it though, you will have to plan a trip to Paris. For it was crudely pried out from the chapel of Osiris and transported to France in 1821. It now resides in the Louvre. In its place, is a plaster cast covered in soot. Its details indistinguishable. It is disappointing that so many of Egypt’s priceless artefacts – the ceiling mural from the tomb of Seti I, the bust of Nefertiti, the Rosetta stone, the Funeral Texts from the valley of the kings and so many, many more – lie outside her shores. Meanwhile the debate over whether they are safer in western museums or should be returned to where they rightfully belong, rages on. 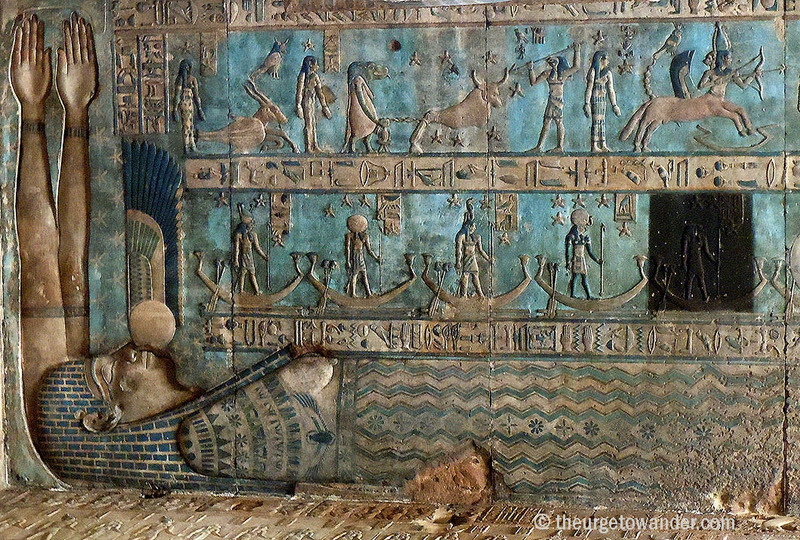 Thankfully there is a lot more in Dendera that could not possibly be carted away. 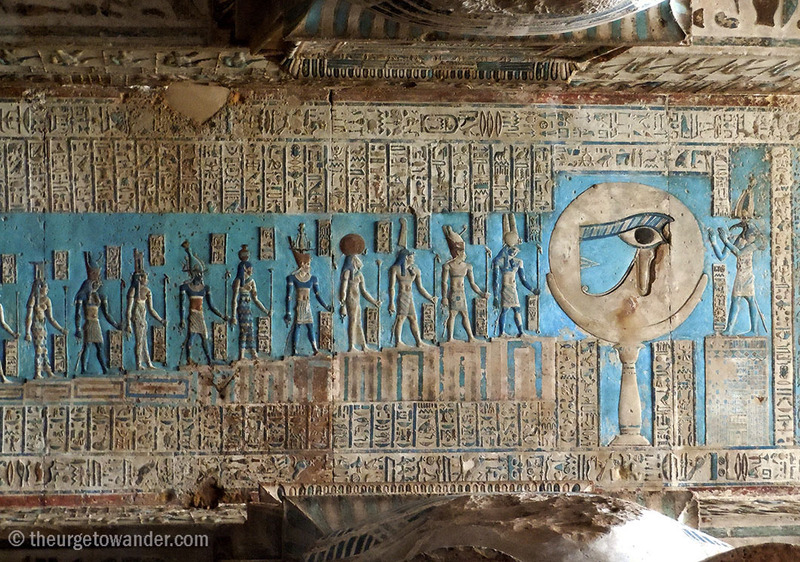 The beautifully illustrated rectangular zodiac ceiling in the vestibule with the 24 Hathor columns is another gem. Hidden for years under the soot of ancient lamp black is the fantastic ceiling relief depicting a celestial chart with the signs of the zodiac in sequence, and another that illustrates the journey of the sun through the body of (sky Goddess) Nut. Astronomical precision and mythological imagery at its very best! — that is to say, Ra — enters within the Duat. It never occurred to me to ask where he parks his barge or the dead souls travelling with him! So glad you enjoyed this Anne! I can’t make up my mind about what is right either. Appreciate your taking the time to comment! Thank You for reading! It is amazing that those colours are still so bright! Hope you do Schtiel! Thank you for stopping by! Thank YOU for the kind comments, Sonel! So fabulous that you were able to visit these Egyptian wonders. The pictures are beautiful, and the azure blue against the earth tones are breathtaking. Interesting history as well! Thank you Elisa! We were fortunate that the place was still open without any restrictions. Think you need to go in a convoy now. It always amazes me how advanced ancient peoples’ (including the Egyptians’) knowledge of astronomy. Thousands of years later, with modern technology, we keep confirming how accurate their calculation was. Me too Bama! Apparently there is not one thing accidental or hap hazard in that ceiling panel! Missed seeing it on my last visit to the Louvre. Will be my priority on the next, for sure. Again, your photographs are wonderful. Thanks for presenting this information. The quality of Egyptian art and science continues to astound. Thanks again. Wonderful photos of places I doubt I will ever see. I hope you do, Angeline! I firmly believe that if you want something badly enough, you will make it happen 🙂 Thanks for the feedback! You are really making me want to go to Egypt! It is a shame that many of their artifacts no longer reside in the country. The arrogance of other nations is astounding. That is the intention of my blog TBM 🙂 Yep it is sad that some of the best pieces are outside! Thanks for stopping by! Wow, I was so excited to see this gallery of pics today. What a treat!! They are just fantastic, I think I would spend days there going over all the details but I’d find it really hard not to touch it!!! Thanks so much Madhu, this is a page I’ll bookmark and revisit. I LOVE the relief work, it is amazing and the symbolism and intricate carvings are beautiful and so brilliant considering there were no laser cutters or power tools. It is some of the most astounding and beautiful of all human creation I think. What a wondrous experience to see it in person. I understand the dilemma of the return of antiquities to Egypt, it is a sensitive and political topic but I am so grateful that I have been able to see a small number of travelling treasures. Haha – yes it would seem that Nut swallows the sun and gives birth to it again in the morning which means the barge travels through Nut (and the underworld) during the night. It’s really interesting to see how the myths evolved over time between the old and new kingdom and how people began to tell stories to make sense of their world. Thankfully the Egyptians documented their stories and their discoveries. These treasures probably contain more information and codes than we’ll ever know – what treasures they are indeed. Fantastic pics Madhu – thanks again. If I had to make a post of the best comments on my blog, yours would be right up there 🙂 Thank YOU dear Louise for your very encouraging feedback! The ancient Egyptians certainly had no shortage of imagination – I don’t know how they came up with all those myths and symbols! It is just remarkable how the temple’s colours still sparkle after all those years of exposure. Thanks for sharing, Madhu! Think it is more symbolism than myth. Just like in India, every story and symbol has a definite meaning and purpose. When you delve into its symbolism it doesn’t seem so fanciful anymore! I much prefer these ancient myths to the rigid, fanatic tenets of our evolved religions! Hope that made some sense 🙂 Thank YOU for reading James! Oh – thank you so much for posting this 🙂 Love the photos – they’re so clear! They are given in recognition of your wonderful blog and how I enjoy reading it. No hurry to respond, only the Sunshine Award has a rule. Thank you so much Francine! Congratulations to you too! Stunning photos with a fascinating history! Thanks for sharing with a smalltown girl :). These photos are amazing; your obvious attention to detail in the history, the artifact itself, and the story behind the photo is what keeps me coming back. I spent a semester abroad in Europe and -to use the cliche- it changed me as a person…travel does that-as a whole. Now that I have experienced the foreign European side of travel, my sights are now set on the truly foreign and exotic- Thailand, Egypt… Thanks for inspiring me again with these photos! Glad you think so Hbreck! Thank YOU for reading and taking the time to comment! Mindboggling really! Thank you for your comments Orples! Absolutely Tita! 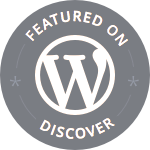 Your encouraging feedback inspires me to write these posts, so thank YOU! My position has always been that these stolen artifacts should be returned to the African and Asian naitions they originated from… sadly, they won’t. TY! I doubt they will ever do! Thank you for the feedback Eliz! What a fantastic entry for “journey”! Ithought I have seen all in Louvre… This 8 feet square, sandstone ceiling panel from 50 BC is astonishing, so are the columns and wall carvings. How did they do and know with what they had? Thank you for the link allowing me to come back and enjoy the tour all over again. Back for another look. 🙂 It’s a beautiful post, Madhu. This 2012 post of yours just came to my attention via one of your blog followers. Thank you again for the education and tour rides you take us on frequently. Your page is worth visiting.